In addition to the picture-perfect beaches and incredible pool options, “Puerto Aventuras” translates into the port of adventure, so you and your guests will never have a dull moment at this resort. Look out over the marina filled with beautiful boats or find the hidden beach spots, enjoy a movie under the stars or a romantic private dinner on the beach! 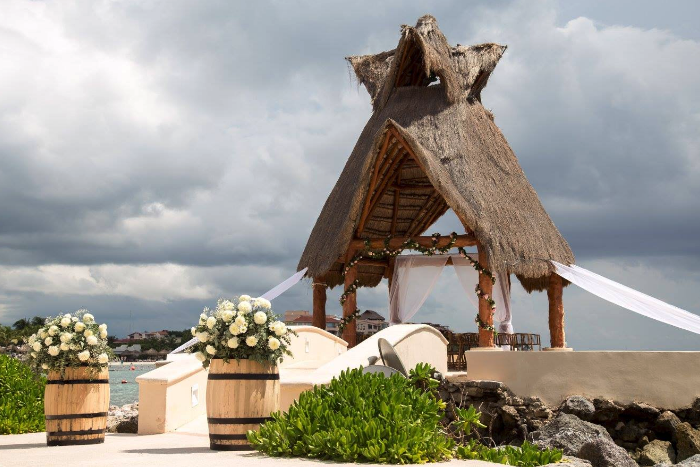 Dreams Puerto Aventuras will make sure you cherish the memories you make during your destination wedding effortlessly. There are only three pools, but one is on the beach with natural saltwater and surrounded by coral! There is also an adults-only section with a pool, jacuzzi, and beach area. Swim with the dolphins and manatees at one of the largest dolphinariums in the Riviera Maya, or enjoy a round of mini golf with all your family and friends! For adventurous guests, explore and learn the history of the nearby ruins of Tulum. 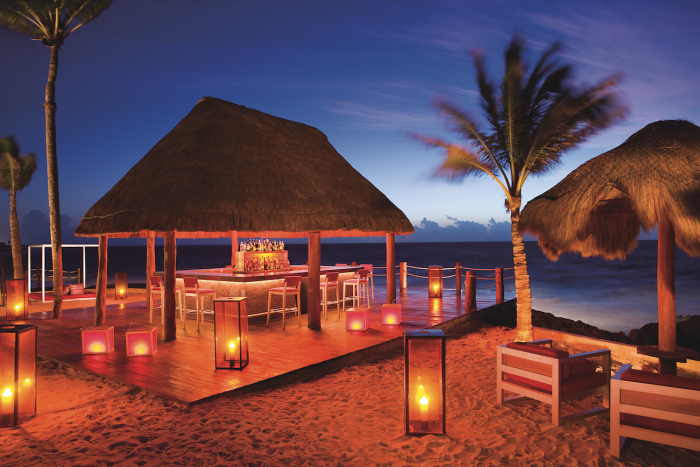 We are an AM Resorts preferred partner, able to offer additional amenities to our couples. These include romantic continental breakfasts in bed, spa treatment discounts, and free romantic dinners. Contact us for more details. The base price for this package is $999 but complimentary when booking at least 7 nights in the required room category or higher or if 5 rooms, any category, are booked for at least 3 nights. With this package if you stay a minimum of 5 paid nights over your first anniversary, you will receive 2 additional nights free! 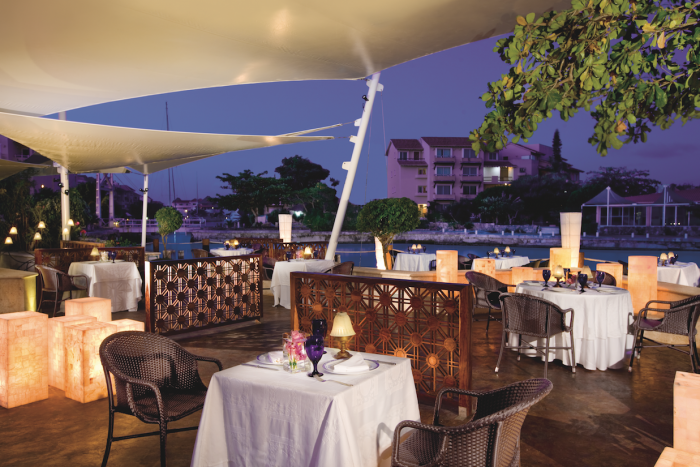 You also have the option to stay 4 paid nights over your first anniversary to receive 1 additional night free. Beach – 200 guests max, Gazebo – 90 guests max. The resort will host 2 weddings per day Monday thru Saturday. Weddings will be held at 3pm or 5pm. The wedding coordinators typically respond within 2 – 3 business days. During the resort’s busy season, they may take longer. Rooms range from $130 – $200 per person per night. All rooms include wifi. Adults looking for a romantic stay will enjoy the honeymoon suites with jacuzzis on the terraces. Although it is not located in the Preferred Club section, guests staying in the Master Suite Ocean View room will have full access to the Preferred Club lounge and amenities. Children ages 2 and younger stay free, and kids 12 and younger can stay free during certain times of the year. There are 305 total guest rooms with views of the garden, pool, dolphin pool, and ocean. Guests with children will enjoy the dolphin pool view rooms, where they can watch the dolphin experience from the comfort of their own room. Connecting rooms are available upon request, and everything at the resort is within walking distance. High-season months typically include February, March, April, May, June, and July. It is always encouraged to have your guests book their stay 6 months in advance since the hotel can sell out during these months. All rooms allow up to 2 adults and 2 children max or 3 adults. The family suite rooms will allow up to 6 guests with 3 adults and 3 children max. The honeymoon jacuzzi rooms are the only adults-only rooms with 2 adults max. Children are ages 12 and younger. 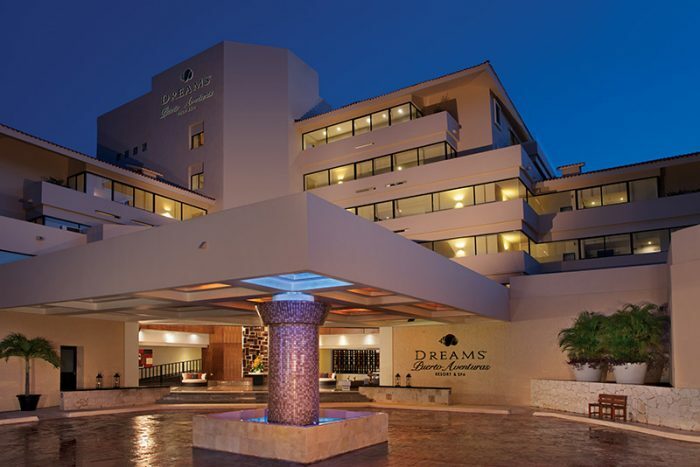 Dreams Puerto Aventuras is located about 50 miles from the CUN airport. The resort is about 15 minutes outside of downtown Playa del Carmen. 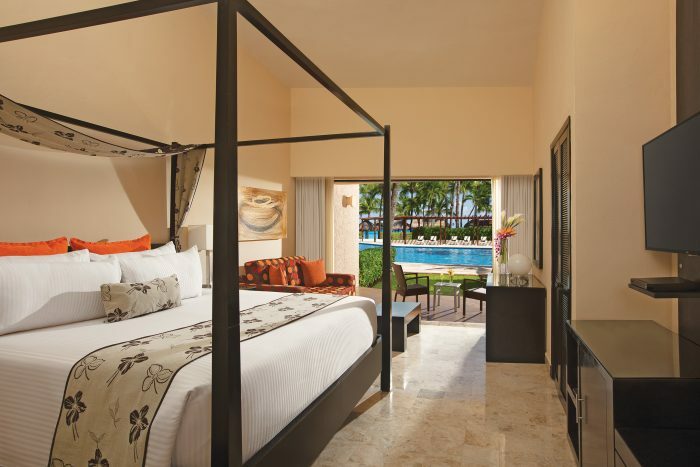 Dreams Puerto Aventuras is located 50 miles from the CUN airport. The resort is about 15 minutes outside of downtown Playa del Carmen. 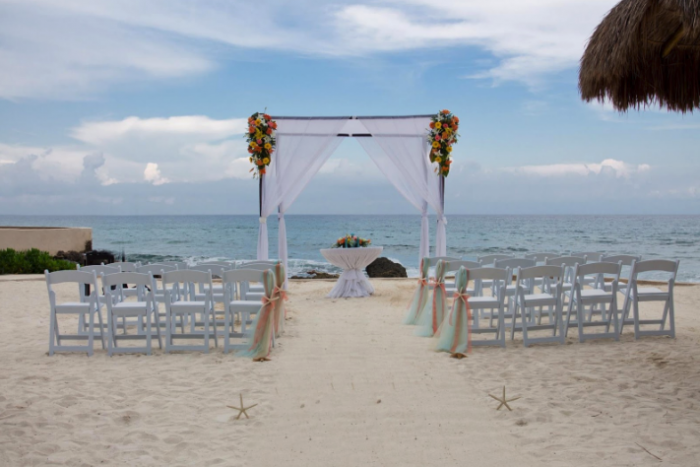 A: The resort is perfect for a destination wedding because of the beautiful venues, and of course the wedding planners have full knowledge and experience in Weddings. 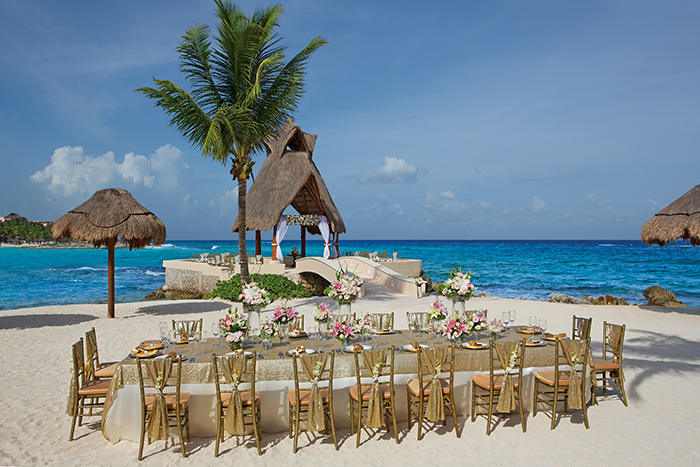 A: My favorite part is that you can do the wedding in a beautiful paradise setting, and guests can enjoy a great time with family and friends for a couple of days or weeks. A: All of the staff, not only the weddings staff in general, because the bride & groom love to feel pampered during their stay as well.